When the Irix 11mm f/4 Firefly Lens showed up, I had a couple of subjects immediately in mind for it. The Cathedral Parish of St Patrick in Harrisburg, PA was one of them and on the next very-cloudy day, I made the trip to this beautiful place. 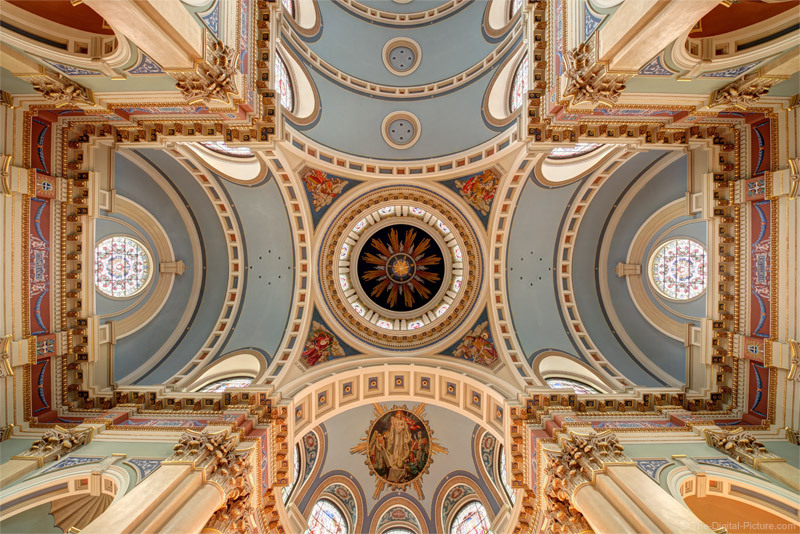 Why did I need a cloudy day to photograph the interior of a church? Any direct sunlight shining through the windows creates overly bright spots on the interior. While daylight was needed to light the inside of the church and bring life to the stained-glass windows, strongly-diffused sunlight creates a far more even light than direct sunlight. Perhaps the biggest challenge to creating an image like is perfectly aligning the camera to the ceiling. With the centered framing, the camera must be positioned precisely below the subject in the exact center of the frame. Often aiding in finding this exact position are tiles and other structural elements that help indicate where the center of the floor is. I had another aid in this case. The gold-colored subject dead center in the frame is a chandelier that hung far below the ceiling. When I saw the gold chandelier centered in the blue and gray area of the ceiling behind it, I knew that the camera was perfectly centered. Centered, however, did not mean squared. The Really Right Stuff TVC-34 Carbon Fiber Tripod and BH-55 Ball Head were especially helpful for this part of the endeavor. I wanted as much of the ceiling in the frame as possible, so I fully retracted the tripod legs, which, with the precise construction of this model, meant that the tripod was level. Similarly-precisely-constructed is the BH-55 ball head and with the stem fully against the bottom of one of the drop notches, the camera was directed straight up. With the camera centered and angled straight up, only final adjustments were needed. The camera still needed to be rotated within the notch (adjust the camera so that it is visually straight up to get started) and then I simply rotated the tripod on the ground, keeping the camera in its centered location, until the viewfinder showed that it was squared with the ceiling. Yes, panning adjustments could have been made using the head's panning feature, but rotating the camera around the head moves the camera slightly from its centered position, meaning that the tripod would need slight repositioning anyway. So, I simply adjusted the tripod position to begin with. Using a Canon Angle Finder C made finalizing the absolute straight-up framing much easier (as would a vari-angle LCD). Focusing with this manual-focus-only lens was simple. I turned the focus ring to the slight detent/bump at the infinity focus mark and everything in the frame was in focus. The 11mm depth of field is huge at normal subject focus distances and this haptic-feedback setting works for a large number of uses, including with wider apertures than the one used here. This is an HDR image, processed with Photomatix. I left the cathedral quite impressed with the Irix 11mm f/4 Firefly Lens. The angle of view it provides is amazing and my first impression is that image quality is very good, especially for the very low price of this lens. A full review of this lens is planned for the near future. A larger version of this image is available on Flickr.